I wore my trusty leather jacket.. need I say more? It's my all year round saviour, I really do love a good leather jacket because they're just so versatile and can be worn with anything. If you don't have a leather jacket then you NEED to get one! The jumper is from Vero Moda, a brand I hadn't heard of but as I was browsing through ASOS I came across a few jumpers I liked; this one has three white stripes going across it which add a slight nautical feel and change a plain black jumper. 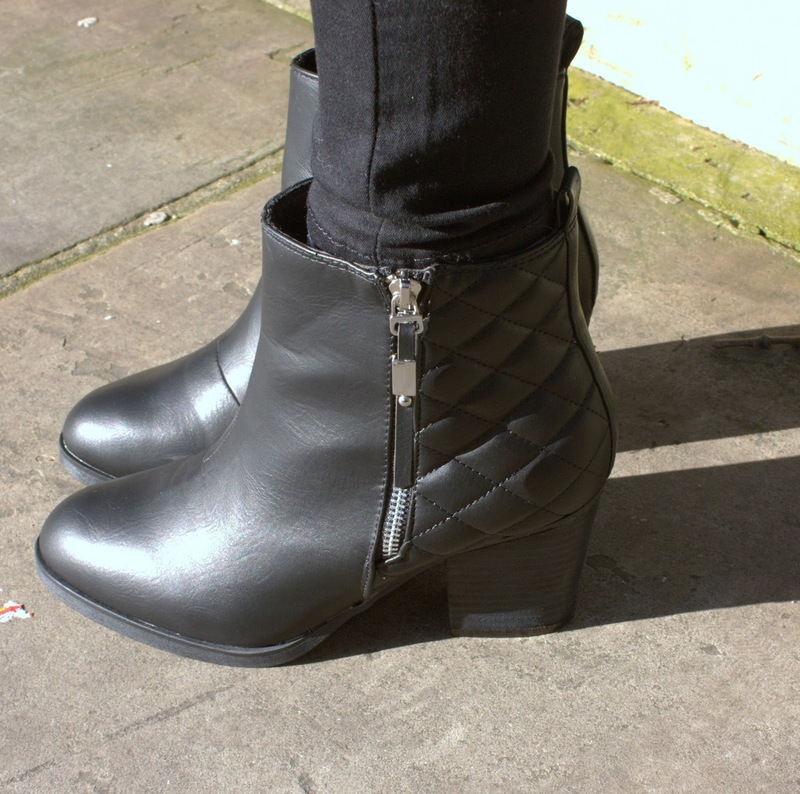 I wore black joni jeans which I seem to be wearing very often this winter without realising it. When I come to writing my posts I think to myself "gosh I've written about these before" haha, but it just goes to show how much I'm relying on them this winter. They're a great fit but quite short on me which is annoying because 32" length is usually fine but these ones are shorter which is annoying if I ever want to wear converse because I need to sport a bare ankle and it's too cold for that at the moment! So I wore a pair of black boots; I fell in love with these boots as soon as I saw them. I'm so happy I bought them; I tend to not buy heeled shoes because I'm quite tall and end up feeling uncomfortable (pretty sure I've said this before too haha) but I love these so much they had to be mine and I love wearing them! My black bag is always making appearances in my posts I felt it deserved it's own dedicated post - you can check that out here for more details. To complete the look I wore a chunky green scarf which is a must in the winter. I don't go anywhere without either wearing a scarf or having one stuffed in my bag because it can get so cold outside. I then wore a silver Parfois necklace, silver Primark rings and some small silver hoops from a Portuguese jewellers. Would love it if you followed me on Bloglovin', Twitter, Facebook and Instagram for blog updates! ahh I LOVE your scarf! So lovely.